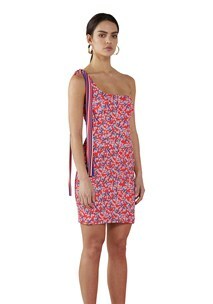 Distinguished by structure, this BY JOHNNY mini dress is perfect for your upcoming summer events. The Asymmetrical dress features a long tie on one shoulder in a contrasting nautical red stripe and is made from bubble crepe. 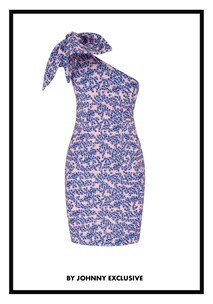 The Floral Contour Tie Mini Dress sits firm on the body and includes front darts to effortlessly flatter the form. The dress is fully lined and possesses a chunky metal zip on the side of the garment.